Y'all I am excited to officially announce that award season is here! 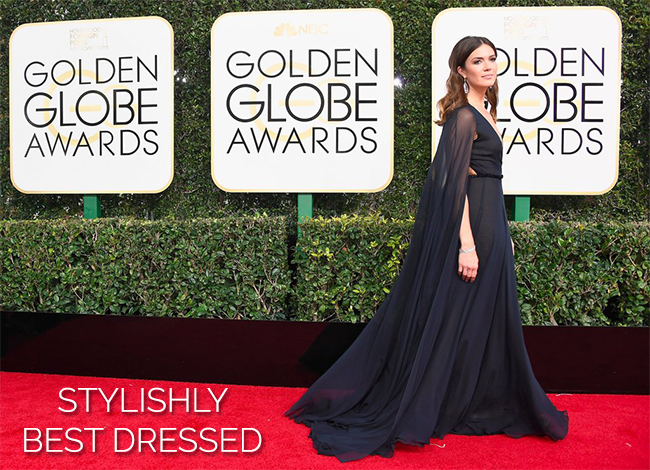 Last night it kicked off with the Golden Globe Awards and it didn't disappoint one bit! Not only was the show hilarious thanks to host Jimmy Fallon but the fashion was out of this world. This award season is going to be MAJOR! Not only was it a gorgeous day in LA but what I saw on the red carpet and during the show made my jaw drop in some cases. I am excited to share my very first best dressed list of 2017. Some major trends last night were white, sparkles and bold dresses! It was so hard to pick my favorites as there were SO many but here are my picks from last nights show! Blake Lively can really do no wrong and this black and gold Atelier Versace dress is just out of this world! Felicity Jones nails it once again in Gucci. Drew Barrymore in Monique Lhuillier is just flat out amazing! Natalie Portman in Prada and channeling Jackie O. Get this, her Tiffany & Co bracelet is from 1910! OH.MY.GOSH. Sienna Miller just continues to prove why she is probably my favorite dressed celeb EVER! Michael Kors has done it well! I cannot get enough of this white Louis Vuitton dress Michelle Williams is wearing! What did y'all think of the show!? Was it not amazing? Who was your favorite dressed? Hope you all had a great weekend.